The Republic of NIGER is a land locked Nation in West Africa located along the border between the Sahara desert, Mali, Algeria, Nigeria, Libya, Burkina Faso, Benin, Togo, Chad. The Capital is NIAMEY, and the official language is French. 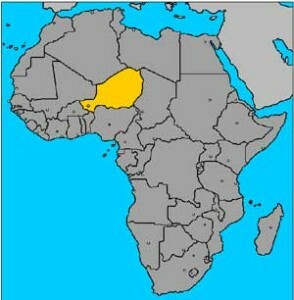 NIGER was named by the River. It’s the main principal river of western Africa extending about 4.180 km (2600 miles) who make it as the third longest river in Africa after the NILE and CONGO RIVER. NIGER is four-fifths the size of Alaska. The NIGER RIVER in the southwest flours through the country’s only fertile area; elsewhere the land is semiarid. NIGER was incorporated into French West Africa in 1896. There were frequent rebellions, but when order was restored in 1922, the French made the area a colony in 1958, the voters approved the French constitution and voted to make the territory an autonomous REPUBLIC within the French community. The REPUBLIC adopted a constitution in 1959 but the year after withdrew from the community, proclaiming its INDEPENDENCE. NIGER is also home of the last wild Giraffe of West Africa. 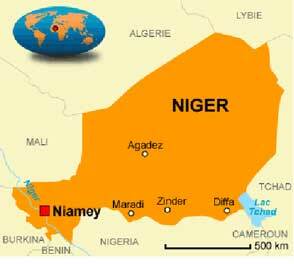 Niger is a developing country, and is consistently one of the lowest-ranked in the United Nations’ Human Development Index (HDI); it was ranked 186th of 186 countries for 2012. Much of the non-desert portions of the country are threatened by periodic drought and desertification. The economy is concentrated around subsistence and some export agriculture clustered in the more fertile south, and the export of raw materials, especially uranium ore.
Niger remains handicapped by its landlocked position, desert terrain, poor education and poverty of its people, lack of infrastructure, poor health care, and environmental degradation. The literacy rate of Niger is among the lowest in the world; in 2005 it was estimated to be only 28.7% (42.9% male and 15.1% female). Primary education in Niger is compulsory for six years. The primary school enrollment and attendance rates are low, particularly for girls. In 1997, the gross primary enrollment rate was 29.3 percent, and in 1996, the net primary enrollment rate was 24.5 percent. About 60 percent of children who finish primary schools are boys, as the majority of girls rarely attend school for more than a few years. Children are often forced to work rather than attend school, particularly during planting or harvest periods. In addition, nomadic children in the north of the country often do not have access to schools. Niger’s high infant mortality rate is comparable to levels recorded in neighboring countries. However, the child mortality rate (deaths among children between the ages of 1 and 4) is exceptionally high (248 per 1,000) due to generally poor health conditions and inadequate nutrition for most of the country’s children. According to the organization Save the Children, Niger has the world’s highest infant mortality rate. Nonetheless, Niger has the highest fertility rate in the world (7.03 births per woman according to 2013 estimates); this means that nearly half (49%) of the Nigerien population is under age 15. Niger has the 11th highest maternal mortality rate in the world at 820 deaths/100,000 live births. There were 3 physicians and 22 nurses per 100,000 persons in 2006.